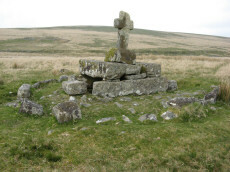 Guidance for walkers: The monuments featured in this database are archaeological treasures and need to be protected and preserved - please do not disturb any sites. Please check access and firing times before visiting sites, not all sites listed are on open access land. Firing ranges and boundaries of open access areas are marked on the OL28 OS Dartmoor Explorer map. Please stick to the country code and consider giving support to the numerous agencies that help to keep Dartmoor a fabulous natural and historic environment! About the database: In all listings clicking on the photo will open a page for the site with a larger photo. The listings are drawn mainly from scientific journals and will not include the most recently discovered minor sites. There is comprehensive coverage of stone circles, stone rows and menhirs. 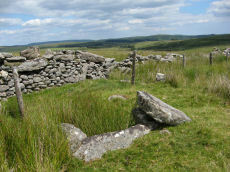 Listings for cists and cairn circles should cover most of the better known sites. There are only partial entries for round cairns, settlements, pounds and none for reaves. For listings of specific types of monument click on Resources in the menu above. Corrections, or any feedback or suggestions are very welcome, email: info@dartmoorwalks.org.uk. NOTE: Clicking on the icons for each monument in the map will give the name of the monument. Where icons overlap they are replaced with an icon with a number - zooming in may separate them out. Notes: Turner E33. Dixon #94. Butler Vol. 4. Map 64.4 (diagram p.220). Grinsell LYDFORD 96. "A much disturbed cairn, 9m in diameter and 0.3m high with a modern 'kerb' of blocks and slabs, 5.8m in diameter and 0.5m high, set upon the mound. 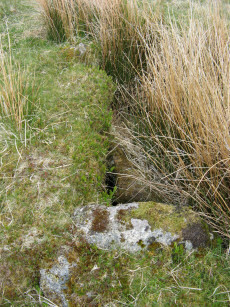 At the centre is a well built cist 1.4m long, 0.5m wide and 0.6m deep. Over this is a two tier pedestal of eight well trimmed blocks, of three different lengths; a further half buried block lies S of the monument. Upon this is a replacement socket stone and cross, cut at Holne in 1885". Lethbridge diagram p.93, photo p.94. Notes: Dixon #19. Bar Rep. 24. Butler Ter Hill N.W. 1 - Vol. 4. Map 64.3 (diagram p. 219). Grinsell LYDFORD 97. "The cist is 0.6m deep and 1.2m long, the NW end is 0.4m wide and SE end 0.6m wide; the NW end-slab, said by Burnard (1905)to be wedged in the bottom cannot be seen. The coverstone, resting on the NE side, is 1.6m by 1.3m at its extremeties". Lethbridge diagram (Cist A) and photo p.93. Notes: Dixon #20. Bar Rep. 24. Butler Ter Hill N.W. 2 - Vol. 4. Map 64.3 (diagram p.219). Grinsell LYDFORD 98. "The turf-covered cairn is, at maximum, 3.9m in diameter and 0.3m in height. The cist, oriented NW/SE, is approximately 1.3m by 0.55m, and 0.75m deep, and now almost hidden by the SW side stone which has fallen inwards. The NE end stone is not evident but an 0.7m high upright granite post retains part of the mound on this NE side. There is no trace of the coverstone". Lethbridge diagram p.93 (Cist B), top photos p.94. Notes: Turner E19 (Fox Tor Newtake). Butler Foxtor Mires W. - Vol. 4. Map 64.6 (diagram p.222). 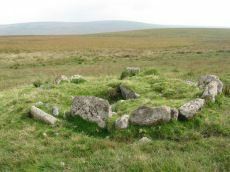 Cairn with kerb circle, visible on N, E & W sides, with a central cist. "Seven large orthostats of the retaining circle remain in situ on the south and south-east side (see plan). The cist is entirely below ground level to a depth of 0.7m and measures 1.0m by 0.6m. 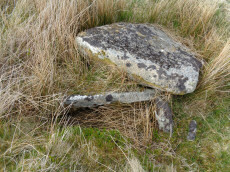 The two endstones and two sidestones are visible; a stone which may be the coverstone lies on the ground to one side". Lethbridge diagram p.93, photos bottom p.97. PMD: Fox Tor Mires E.
Notes: Butler Goldsmith's Cross E. 1. Vol. 4. Map 64.5 (Cairn 1 - diagram p.221). There is no NMR for this site. There is an HER entry MDV61775 which matches precisely with the OS reference given by Butler. 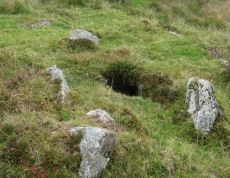 Butler describes: "The mound 0.1m high at best surrounds a slightly wedge-shaped cist of which only the sides, one composed of two stones, and an end are visible. The missing slab is probably buried in place". Notes: Turner D23 (Fox Tor Mire) - Proc Devon Arch Soc 48 (diagram p.45). Butler Goldsmith's Cross E. 2 - Vol. 4. Map 64.5 (Cairn 2 - diagram p.221). Grinsell LYDFORD 95 (Fox Tor Mire). "West end stone of cist leans slightly inwards, otherwise a perfect cist measuring 0.75m NW-SE by 0.5m wide by 0.4m deep. Retaining circle of 7 stones averaging 0.4m high. No coverstone or barrow". Lethbridge diagram p.93, photo bottom right p.95 and on p.96. Notes: Dixon #85 (Fox Tor Newtake No. 2). Bar Rep. 58. Butler Goldsmith's Cross E.3. - Vol. 4. Map 64.5 (Cairn 3 - diagram p.221). Grinsell LYDFORD 94. 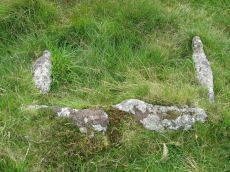 "The NW sidestone, 0.8m long by 0.2m wide and the NE endstone 0.6m long, 0.15m wide are the only recognisable cist stones though it is possible that the SW side was formed by the two small slabs still visible and depicted by Worth. There is no coverstone". Lethbridge diagram p.93, photo bottom left p.95. Notes: Dixon #44 (Fox Tor Newtake, Near). Near Whealam Stream. Bar Rep. 46. Butler Goldsmith's Cross S. - Vol. 4. Map 64.5. (Cairn 4 - diagram p.221). Grinsell LYDFORD 100. "The remains of a cist lie some 80m E of the Whealam streamworks at SX 61666985, on gently sloping ground 50m S of the newtake wall. The remains consist of four granite slabs set into the ground, forming three sides of a trapezoidal structure. It measures 1.2m long and a maximum of 0.85m wide. The long side, unusually formed of two granite slabs, is oriented NW to SE. The maximum height which the stones protrude above the ground is 0.2m. The SW side of the structure is missing; there are no traces of a capstone or cairn". Lethbridge diagram p.93, text p.96, photo top p.97. Notes: Turner Stone Circle G22. Bar Rep 30. "A stone circle with six identifiable erect or leaning stones. One forms the E post of the gateway, the west post, 7ft high, stands outside the circumference. It is because of its small diameter, without doubt a retaining circle; any internal features such as a central hollow or possible kistvean have been obliterated by the wall builders." Notes: Turner B7. Dixon #28. Bar Rep. 30. Butler Joan Ford's Newtake 1 - Vol. 4. Map 63.3 (diagram p.214). Grinsell LYDFORD 92. "A low kerb within the disturbed fringes of the mound is 8.7m in diameter with more or less continuous upright slabs and boulders 0.3m to 0.6m high. A dry stone newtake wall crosses the N side and overlies part of the kerb. A well-preserved cist, oriented NW-SE, is internally 1.0m long, 0.5m to 0.65m wide and up to 0.7m deep. The coverstone leans against the SE side of the cist and measures 1.35m by 1.0m by 0.2." Lethbridge diagram p.99, photo bottom p.99. 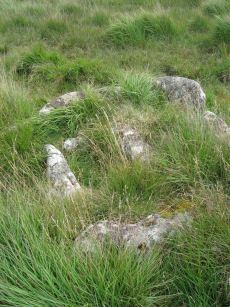 Notes: "This impressive disturbed turf-covered cairn on the summit area of Royal Hill at 394m OD. It measures 16.4m (N-S) by 15.6m (E-W) with a maximum height of 1.8m. The flattish top has an off-centre pit 4.5m by 2.4m and 0.8m deep with some upcast material dumped around the top edge. Damage to the perimeter, reported in 1982 (8), has mostly been reinstated. The cairn is variously named Broken Barrow, Broken Barrows and Brokenborough"
Notes: Turner E31. Dixon #22. Bar Rep. 27. Butler Royal Hill E. 3 - Vol. 4. Map 65.5 (Cairn 3 - diagram p.233). Grinsell LYDFORD 88. "The cairn is 4.9m in diameter and 0.4m high with a flattish, platform, top. It is retained by a kerb of almost contiguous orthostats, the largest 1.1m long, 0.2m thick, and 0.6m high. A few are fallen or displaced. The central cist is oriented WNW to ESE, lacking both coverstone and N side slab. Internally it measures 1.35m by 0.75m by 0.55m deep." Lethbridge diagram p.97 Cist A, photo p.98. Notes: Turner A18. "Disturbed ring cairn consisting of a stone ring 8.0 meters in diameter internally with bank 1.0 meter wide and 0.2 meters high."